(PRLEAP.COM) Montreal, QC - March 7, 2018 - Cerri launches Version 2.0 of its project collaboration tool after its initial beta run. The tool promises to provide a sleek layout that will allow users to understand what needs to be done at a glance of the dashboard in the Central app, while allowing them to drill down so they can view their to-do list, prioritized by upcoming deadline in the Task app. This version will also allow users to synchronize their Google and Outlook Calendars with Cerri, allowing them to keep all of their tasks in a central location. "The thing we're most excited to give our users is the ability to store files in a central repository," says Vasily Klimko, Product Owner for the Cerri family of apps. "We listened to the feedback that we collected during our beta, and the issue that most of our users had always circled around sharing files and managing permissions. We listened to what they had to say and made sure to make sharing all sorts of files was easy with Cerri's default permissions. We can't wait to hear what people have to say about this version." Cerri's family of apps allows team members to seamlessly collaborate on a number of projects using its Central, Task, and Calendar apps. Founded in 2017, Cerri has grown the team in its Montreal office to include more developers and testers in the past year. With activity in the transportation, legal, and construction fields, Cerri is primed to have a productive 2018. In addition to introducing the new version of their product, Cerri will also be creating an incubator for local Montreal companies to use its product free of charge. Check out Cerri.com or email marketing@cerri.com for more information. About Cerri - The Cerri family of apps was designed with the user in mind, without sacrificing the safety that organizations demand. 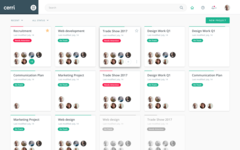 Cerri allows you to create and manage projects across your organization, sync your Outlook and Google Calendars to a single scheduler, create and manage tasks across all your projects, and collaborate on files with your team via their central file repository. Cerri is multilingual and provides on-premise solutions, making it an ideal fit for a variety of organizations across the world.